I am sharing with you here, the first post I wrote regarding minimalism, it was in March. I actually am a bit surprised that I am checking out the minimalistic lifestyle to the degree as I am now because I was not very into it at first. In Tidy Tutor World we know that too much stuff is our biggest problem and we continually dejunk and incorporate habits to NOT bring excess into our homes, so I really thought that, for us, this was not necessary. But, after meeting The Minimalists (Joshua Fields Milburn & Ryan Necodemus) this month, it had such an impact on me that I thought I would try dejunking with a minimalist mindset, and while doing so, I learned some things. It actually made me start thinking about my possessions being my identity and how much I desired to get rid of things that I never cared about getting rid of before, and so, it evolved into an experiment. So I thought it would be apropos to re-share this email and video with you to get back to square one in this journey. Below is TIOT from March 2014. For this Throw it Out Thursday I want to visit the ongoing challenges that I always see online year after year encouraging us to dejunk and get rid of the excess clutter in our lives. If I recall correctly it always has to do with some kind of countdown of days, and a “fill a bag” or an item count for a specific amount of time. I often have thought that OG (Organizationally Gifted) people were presenting those challenges, because I am always a bit taken aback when I see some of the ‘forms’ that are suggested for those participants to print and fill out so they can keep track of their de-cluttering progress. The forms are kinda complicated, and since that isn’t how we tick, I thought, they have got to be OG (Organizationally Gifted). Yes we like plans and we love to report. But there is a line drawn when things get to be WORK. Remember? If is isn’t fun, we don’t want to do it. Now, I do know that Flylady has done a trash bag count type challenge or two, and she is as I am, a self proclaimed reformed slob. So that blows that theory out of the water (for the record: she doesn’t offer a complicated form to fill out while doing it). Something else… decluttering challenges aren’t always done by organizing gurus either, and I know that, because that is what prompted me to chose this subject for this Throw it Out Thursday. It was a post, that a darling Tidy Tutor University student put up on our members Facebook page in December, a challenge she found from a website she frequented called “TheMinimalists”. Their challenge was to get rid of stuff in a particularly fun way. The Minimalists do not offer help for the OC, their niche is that of finding happiness by living simply and with purpose. Their followers are not Organizationally Challenged People and they don’t have the issues that we do (although some may, but that is not why people gravitate to the Minimalists site). They are people who most likely have it all together, but find that what they thought would make them happy; more money, more stuff, more prestige actually didn’t. Well, now that I’ve given the background as to why I have chosen this topic, I will let you know what I think about challenges to de-junk, and what I have found regarding them. 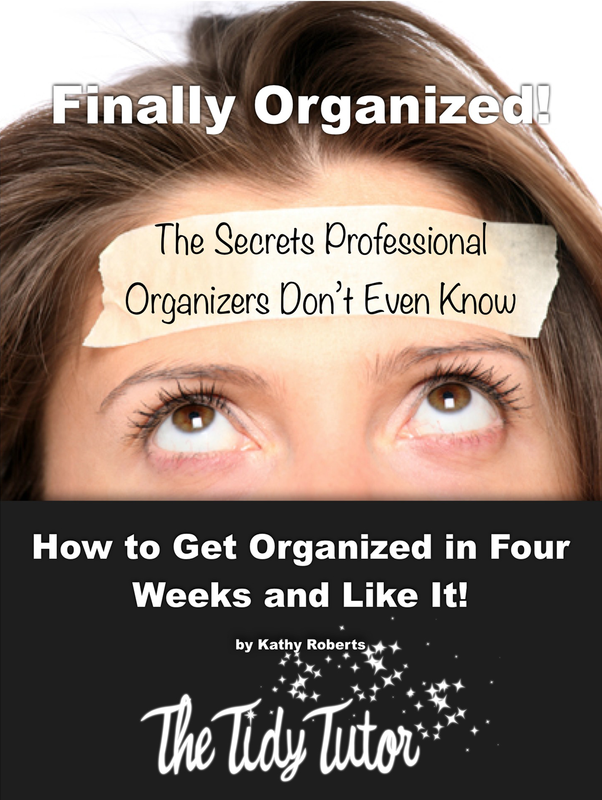 It does prove to be a great boost to help people get rid of stuff, It can be a catapult for many, especially those among us organizationally challenged types, because knowing where to start can be our biggest hurdle. Having a challenge that is spelled out for us can get many moving who wouldn’t have otherwise. And having a crowd of people to work with also is encouraging. What do they say? Misery loves company? Well, I don’t know about that, but I do know that sometimes when things feel futile, knowing that others are doing it can lift that futile feeling and bring someone to a different place to give it a try. In my course I let my students know that our number one obstacle is too much stuff. And that it is impossible to live an organized life or maintain the home we dream of if we have more than we need. So dejunking is a very big part of our program. And it is taught in a way that does not overwhelm and it guarantees that we can not pull out more than we can put back. Often us OC’s make more of a mess trying to clean up than what we started with. I have found that a small percentage of students in TTU who have not been able to embrace a regular routine to get rid of the excess things in their lives, as I have it outlined to do, can do it when it is attached to a challenge to do something in a specified fashion, with a group and then report the progress. Personally I think challenges are great. Whatever works! And because of this discovery, I am going to include a challenge inside of my second session of my course where we go through the HOW TO of the dejunking process. BUT, and you knew there would be a but. Challenges can not be the norm. Challenges to declutter should be for when just getting started, when you want to excelerate the process, when tackling an area you have not worked on such as a storage room or a garage, or maybe when your moving. You see the goal is not to be living a life as if on a treadmill or a merry-go-round, or worse yet a roller coaster, constantly getting rid of things, or getting rid of things a few times a year. If we want real change, we have to have a real plan, if we want lasting change, and a new way of life. We want out of the disorder and chaos. I see perpetual challenges without learning the skill of order, the same as getting a 2nd job delivering pizza’s at night to make ends meet. It is a great idea to do while you are figuring things out, building a business, or going to college or learning a marketable skill. But delivering pizza to provide an added income will only take care of the initial need, and you will always have to deliver pizza, nothing will change, without a master plan. Do you see how dejunking as a challenge all the time is the same thing. What is the goal? What do you want? If it is a Donna Reed life style, challenges won’t get you there, just as delivering pizzas is not the long term solution. You will be on the same ride of which you can never get off. So for anyone who has taken TTU, or anyone who has just registered, I really want to drive this point home, it’s important to know what our goal is. It is to live an organized life, it is to know what to do, when to do it, know how to do all that it is that we have to do, and enjoy living in the space that we have. It can happen, just like it can happen to play the piano if you never have, or to speak a language you don’t know how to speak. It takes lessons, effort and consistency working with a proven method that teaches what you want to know. A few jaunts playing will not make you a piano player, just like a few challenges getting rid of the excess stuff you’ve accumulated will not bring you to a place where you are happily, joyfully, in a peaceful clean home that you have always dreamed of living in.. So, go ahead and challenge all you want, it can be a good thing, with the right perspective and with the right plan. CLICK ON THIS LINK and Enroll. Change your life, join those of us who have learned how, and are realizing the dream, to live in an environment that we have always dreamed of.